Neven Maguire might have the right to name himself an influencer, as the hotel he visited in his last Food Trails has just been revealed as Ireland's top hotel. Harvey's Point, the majestic lakeside retreat in Co Donegal, has been awarded the prestigious accolade, although not for the first time. The hotel had held the title for five consecutive years from 2013 to 2017, dropping only to number two in 2018. The news comes at a particularly bright moment in the hotel's storied timeline as this year Harvey's Point celebrates 30 years in business. We can hear the champagne bottles popping already! Hugging the shores of Lough Eske, Harvey's Point has a fascinating and charming history, having been opened by Switzerland native Jody Gysling in 1989 after he "found a little piece of Switzerland hidden away in the Hills of Donegal", according to the hotel's website, in the snow-capped Blue Mountains. Starting with just one cottage purchased from the Harvey brothers, Jody transformed the swampy land with stones pulled from 10 miles away, eventually opening his little haven into a four-room guest house in 1989. Soon joined by his brother Marc and Donegal native Deirdre McGlone - who is now Managing director and married to Marc - the team added to the hotel bit by bit. 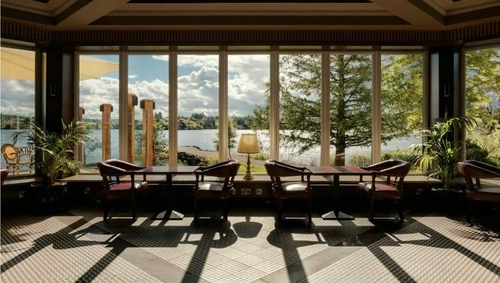 The palatial resort now has 64 suites in the main hotel, as well as the Lodge which features 13 compact cabin style rooms for special interest groups. Speaking about the award, Deirdre said "We are immensely proud of this great achievement, which encourages us to raise the bar even higher in delivering the highest possible standards of world class hotel-keeping blended with genuine Irish and Donegal hospitality." As for the Irish B&B and Inns category. Creevagh Heights in Co Mayo came out on top, followed by Larkinley lodge in Co Kerry and Desmond House in Kinsale Co Cork secured second and third place respectively.